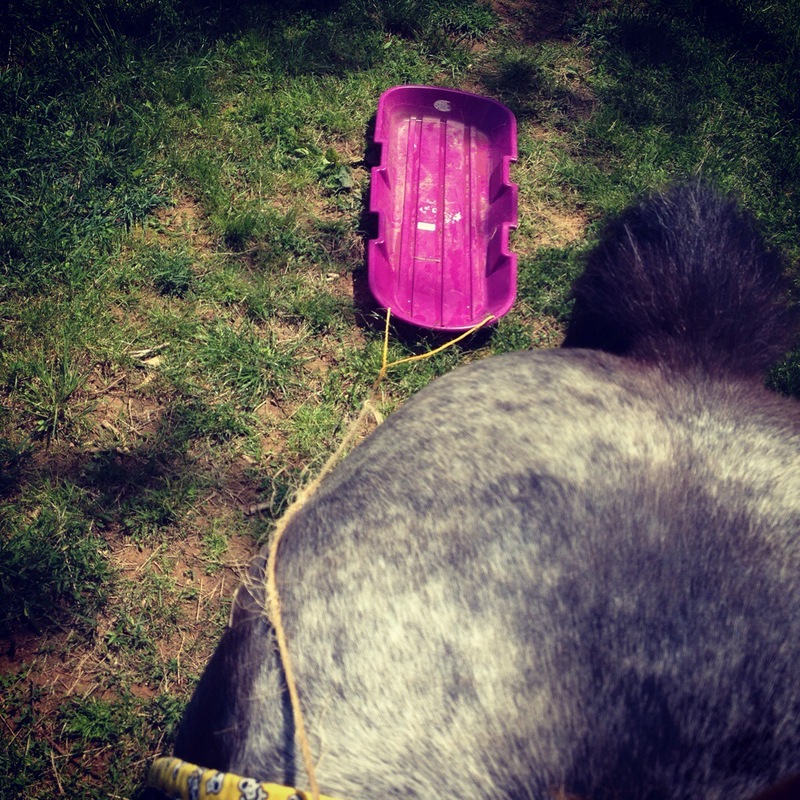 To add a little excitement and diversity to Poe’s training, I decided to try him out with the sled. I got off and pulled the sled next to him on the ground. He did not even look at it. So I mounted up and dragged it behind us. Poe could have cared less. He marched along, sled following, we went through bending poles and all around the field. I stopped him and pulled it towards us. He didn’t care. This got me to thinking. I originally thought Poe would not like Judged Pleasure Rides. He does not like trail riding, which is essentially what a JPR is. But what I think he doesn’t like about trail riding is the monotony. He gets bored just trotting through the woods. But he loves mental stimulation and figuring things out. And a JPR is basically really short trail rides from obstacle to obstacle. So I think I’ll take him to the next JPR and offer Simon to someone else. Until then I am going to have to set up a few weird things to challenge him with. Ill have to stock up on pool noodles and hang up a ripped tarp. I do not think these will phase him. What he is really going to need work on is backing. He has learned to take a few steps, but not many. And he is still unsure about it. And Side passing is something totally foreign to him. So that gives us something exciting to work on. Yea!